Each quarter we feature a different set of products and services at special prices. 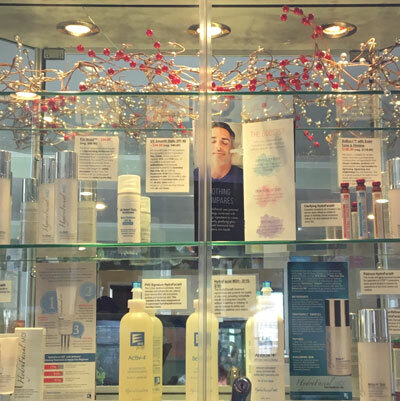 We are pleased to carry a careful selection of medical-grade skin care products that we trust and recommend. Ask us for advice about your own treatment needs for any skin condition–for example, rosacea, acne, dry skin, or anti-aging–and any skin type. Below is a representative sampling. Whatever your skin type, we have appropriate cleansers for your needs. Some are specially formulated for acne- or rosacea-prone skin, extremely sensitive skin, or intolerant skin. This often overlooked step in skin care is paramount to acquiring a balanced, moist, dewy complexion. Avene’s hydration spray is a big favorite among our patients. Our wide selection of moisturizers offers choices for every skin type (dry, oily, combination) and for common skin conditions like rosacea and acne. We offer an array of our favorite sunscreen products. Blue Lizard sunscreens deliver clinically proven, broad-spectrum UVA and UVB protection in a water-resistant, SPF 30+ formulation for every skin type and outdoor need. Avene products are micronized and thus more cosmetically elegant. HydraFacial sunscreens hydrate and provide antioxidant protection. Isdin makes a sunscreen specially formulated for patients with history of actinic keratoses. Periodic exfoliation removes dead cells from the skin surface. This allows for better absorption of products, gives a luminous complexion, and allows for better purging of toxins from the skin. The Neostrata foaming glycolic wash is our favorite: you’ll see a difference in your skin with one treatment. Focused products that treat a specific skin care condition or issue. These can be floated in and out of a core skin care regimen, but they do not replace any core step. If you have dark circles under your eyes or fine lines from aging, we have a serum for you. Jane Iredale cosmetics line for healthy, radiant skin. A full line of hypoallergenic, cruelty-free skin care makeup, created with the highest-quality minerals available and organic ingredients when possible. Here, for your browsing pleasure, is the Jane Iredale catalog for fall 2018.